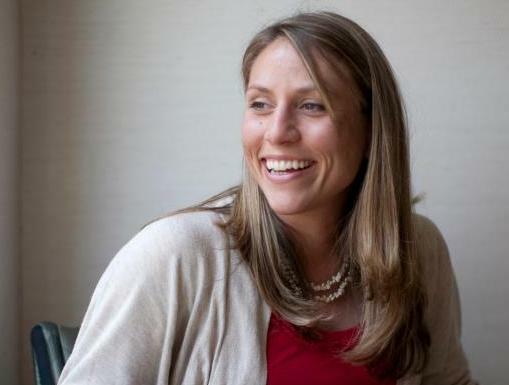 Liz Farmer is GOVERNING magazine's award-winning fiscal policy reporter, writing for a national audience about how state and local governments spend our taxpayer money. Her areas of expertise include budgets, fiscal distress, tax policy and pensions. She also writes about other topics like family-friendly government policy and the role of women in politics. Liz has appeared as a guest on numerous radio and televisions programs such as NPR's 1A and CSPAN's Washington Journal. At GOVERNING, Liz's writing was the driving force behind the magazine's landmark series, Finance 101, which seeks to break down complicated public money issues in ways that everyone can understand. That extensive coverage has included how cities become bankrupt, the popular "7 Deadly Sins of Public Finance," and online features such as videos and explainers on the politics behind pensions. She also created the column, the Week in Public Finance. Liz interviews Jesse Jackson during the Occupy D.C. Movement. Photo by Graeme Jennings. Previously, Liz covered Washington, D.C. city hall politics and local government for the Washington Examiner. Her coverage included the Osama bin Laden capture and killing, the Pentagon's 10th anniversary of the 9/11 terrorist attacks and the historic resignation and guilty pleas of two city council members. She also wrote extensively about the region’s economic development and rapidly changing socio-economic structure. Liz was also a business writer for the (Baltimore) Daily Record and a weekly regular on Baltimore Fox Sports Radio’s Sports with Coleman. Liz received her B.A. from the George Washington University where she studied American history, film and television production. In 2007, she graduated with a Master of Journalism from the University of Maryland. A proud native of the San Francisco Bay Area, Liz remains a devoted Bay Area sports fan. She and her husband live in beautiful Smithsburg, Md., with their son.